If you have a bad time, it’s your own fault! Welcome to Up A Creek! Have someone hold the canoe steady – you don’t want to tip the canoe before you even get out on the water! Always walk along the center – keeping your feet on the centerline will help keep the canoe from rocking. Stay low – do not stand up or walk in your canoe when you are away from shore. Always wear your life vest – you never know when you might fall out or tip over unexpectedly. Avoid sudden or jerky movements – rocking from side to side could cause the canoe to tip over. Be aware of currents in the water – you don’t want to end up floating farther downstream than you planned. If the current starts to pull you along faster or you see lots of rocks in the water ahead of you paddle away from them or paddle towards the shore. Always sit on the seats or in the center of the canoe – sitting on the side of a canoe will cause it to tip over. Stay away from low hanging tree branches near the shore– not only can the branches be uncomfortable if you collide with one, sometimes local fishermen will tie catfish lines to tree branches near the shore. Accidentally snagging one of these lines is a sure-fire way to test those first aid skills. 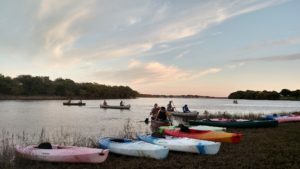 Avoid letting big waves hit the side of your canoe – although the Kaw is generally a pretty calm river, you will see the occasional faster currents around a tight bend or near an eddy. Always try to keep your canoe at a right angle to the waves in order to keep your boat in the most stable position and avoid tipping over. Don’t panic– you’re certainly not the first canoe that has capsized on the Kaw. 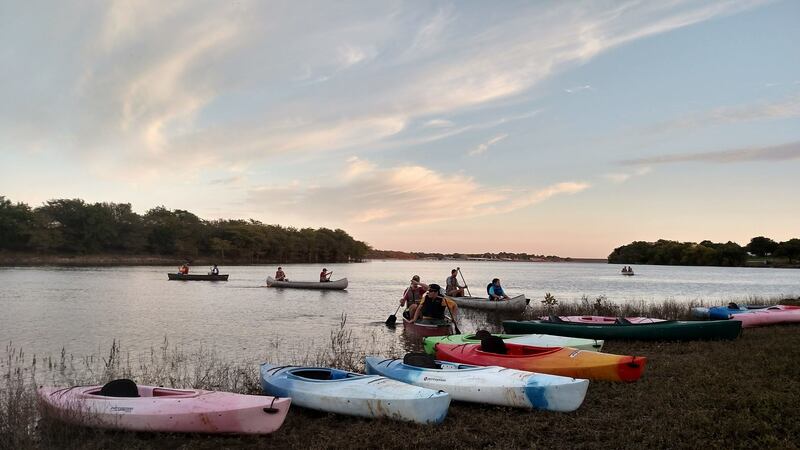 Paddle or push your canoe to shore– with the help of the other person(s) in your canoe, you can get out in shallow water and flip the canoe to dump out the water and climb in. Your canoe will float even if its full of water until you can get to shore to empty it. Tie all of your belongings to the canoe – put your equipment into a waterproof bag to keep it dry and tie it to one of the center beams in the canoe so that you don’t lose everything if your canoe tips over.